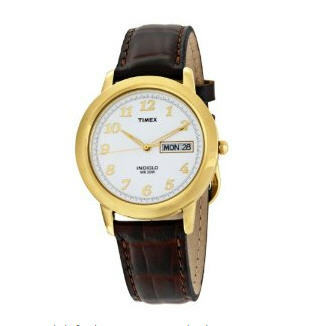 This Timex dress watch's classic style, featuring a gold-toned bezel with matching gold Arabic-numeral indexes and hands on a white dial, is never out of fashion. 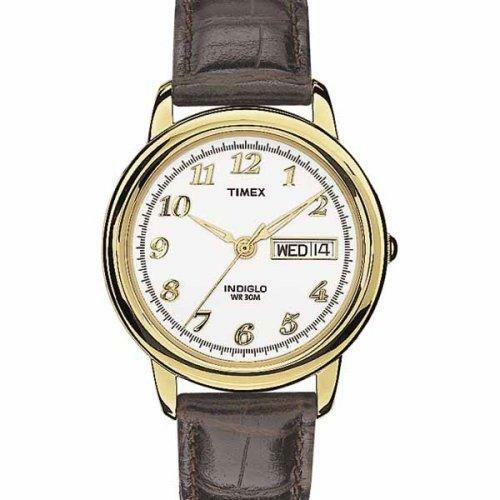 A brown genuine leather band and stainless steel buckle comfortably keep the watch on your wrist. The watch has a day-and-date window at the three o'clock position and features the Indiglo night light, which provides even illumination of the entire watch dial at the push of a button. The watch is powered by a quartz movement, has a mineral crystal, and is water resistant to 99 feet (30 meters).